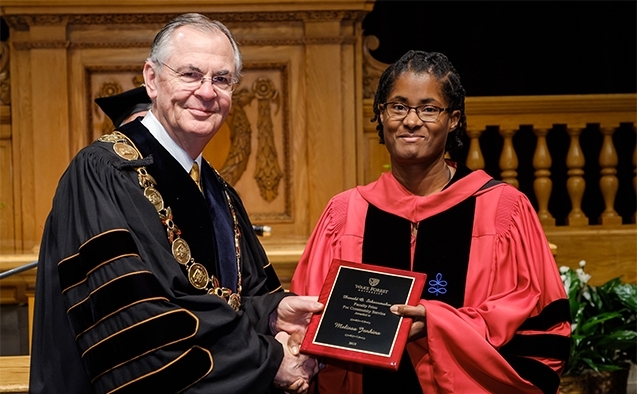 Associate Professor of English Literature Melissa Jenkins received the Donald O. Schoonmaker Faculty Award for Community Service at the 2019 Founders’ Day Convocation in Wait Chapel. The Schoonmaker award is given each year to a faculty member who demonstrates extraordinary community service. Professor Jenkins’s commitment to community service is reflected in her work within the departments of English and Women’s, Gender, and Sexuality Studies as well as the university at large. She volunteers to help the Admissions Office attract and retain minority and international students by regularly speaking at events, teaching mock classes, and participating in fora. She volunteers to register incoming students with the Office of Academic Advising; serves as a Lower Division and English adviser; and, as a Faculty Fellow in Collins Residence Hall, she holds regular office hours and organizes academic and social events throughout the year; she’s even been known to drive groups of students to Greensboro so they can buy the kinds of ethnic foods they were unable to find locally. Within the English department, Jenkins serves as Director of Undergraduate Studies, leads many directed readings and internships for individual students, and serves as faculty adviser for Wake Forest’s chapter of Sigma Tau Delta, the International English Honors Society, which she rekindled in 2018. She also regularly participates in the Pro Humanitate Mentoring Program in the Chaplain’s Office, coordinates speakers and colloquia for English and WGSS, serves on the Clemens Fund, which allocates funding for religious organizations, and is chair and member of many other university committees. In 2009-2010, Prof. Jenkins applied to be an Academic Community Engagement (ACE) Fellow and spent months engaged with a small group of faculty interested in creating service-learning courses for students. Her resulting Writing 111 seminar, “Animals Make Us Human? A Service Learning Course” allows students to write about real issues in the community while working hands-on with the Forsyth County Humane Society. Off campus, she has been a discussion leader at Aperture Theater and a frequent volunteer at local events. She participated in Duke University’s SIPTA program, a mentoring program that pairs tenured and tenure-track faculty of color, from 2016 to 2018.